Welcome to Digital Digest! This week, we have a review of the 1978 Hanna-Barbera TV movie The Beasts are on the Streets, along with all of your other regular features. Let's get started! This week, a list of special features for the upcoming CBS release of Family Ties - The Complete Series was released, and while there is only one additional bonus disc, it appears that it will include a lot of great goodies. Among those goodies are archival interviews, a 2008 cast reunion, the pilot for the spinoff The Art of Being Nick, an episode of Day by Day featuring a Family Ties crossover, a sales presentation, a blooper reel, and more. It appears that those who purchased the individual seasons are out of luck on these bonus features, for now at least, although we're certainly hopeful that there will be some option to purchase this separately in the future as has been done with a few other releases from CBS. It has been a little over a year since we last saw a release of Alfred Hitchcock Presents from Universal, and it appears that we are finally about to see the next season in Alfred Hitchcock Presents - Season Six. But it won't be a traditional release as the first five seasons have been. Instead, it appears that Universal will be dipping their toes into MOD releases with this release, something that we have not seen much of from Universal as far as TV series are concerned. With this release, we'll be left with only one more season of the half-hour version of the series to be released on DVD. Tuesday (October 1) is another busy day for TV on DVD releases. First up are two sitcoms releases from Fox, with How I Met Your Mother - The Complete Season 8 and New Girl - The Complete Second Season. Sony has the MOD conclusion of the series Happy Endings in Happy Endings - The Complete Third Season. For those interested in something older, CBS has The Beverly Hillbillies - Season 4 and Petticoat Junction - Season 3, both of which are available exclusively at Walmart. Mill Creek has some re-releases and some completely new releases, with Wings - Seasons 1 and 2, Highway to Heaven - The Complete Second Season, and Heathcliff - Season One, Volume Two. Finally, Universal kicks off the busy season of complete series releases that are coming our way in time for the holiday shopping season, with Magnum, P.I. - The Complete Series and Murder, She Wrote - The Complete Series. A careening tanker truck rips through the fence of a wild animal park, unleashing an untamed force of nature on an unsuspecting community. The Beasts are on the Streets! Bison, zebras, camels, antelopes and ostriches stampede down the highway. Elephants and rhinos crush cars. A panther terrorizes a family's pet dog. A tiger turns a fleeing bystander into helpless prey. A lion prowls near a home. A local amusement park becomes an arena for a vicious bear-vs.-tiger clash. As park rangers and local cops scramble to recapture the escaped animals, two trigger-happy good ol' boys decide to go big-game hunting. Carol Lynley, who fought her way through an upside-down luxury liner in The Poseidon Adventure, returns to the disaster-pic genre as a dedicated veterinarian thrust into the forefront of the people vs. beasts panic. Also in the cast: Philip Michael Thomas before he shot to fame in Miami Vice. 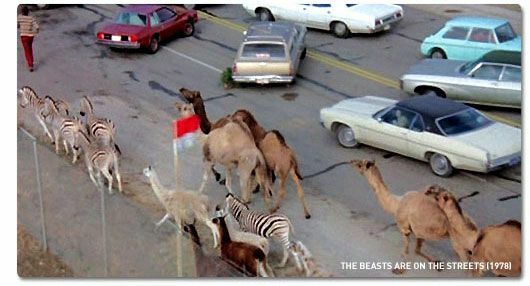 The Beasts are on the Streets aired on NBC on May 18, 1978. Hanna-Barbera makes another all-too-rare foray into primetime live-action for this fur and feather-flying disaster flick. It was produced by Joseph Barbera and Harry R. Sherman. The teleplay was written by Laurence Heath. Frederic Louis Fox provided the story. Peter R. Hunt, who is known for his work as a film editor on many early James Bond films and as the director of On Her Majesty's Secret Service, is the director. The movie stars Carol Lynley as Dr. Carol McCauley, Dale Robinette as Kevin Johnson, Billy Green Bush as Jim Scudder, Philip Michael Thomas as Eddie Morgan and Casey Biggs as Rick. Co-starring are Burton Gilliam as Al Loring, Sharon Ullrick as Lucette Gaynes and Anna Lee as the lady in bed, Mrs. Jackson. The movie comes in a standard Viva eco-box case. The cover art features Philip Michael Thomas, Carol Lynley, Dale Robinette, a tiger, elephant and a lion. The Beasts are on the Streets is written in a large red front. The movie's stars are listed at the top of the case. On the back of the case, there are three screenshots from the movie. A short synopsis of the film, the cast and crew credits, and the DVD specs are provided. Although the movie is over 35-years-old, the video and audio quality is pretty good. I have a homemade VHS copy from about 25 years ago, so it's nice to finally see an upgrade. It's presented in its original full screen 1.37:1 format. The video wasn't remastered for his release, so there is some minor dirt, debris and digital artifacts. There are no major problems. It's all very watchable. The movie was shot on location in Grand Prairie, Texas. The picture has a sharp image. The colors are still quite vivid. For the closing logo enthusiasts, they have a logo for Hanna-Barbera Productions, Inc. The audio is a Dolby Digital English mono track. There is no hiss. The dialogue is clear and easy to understand. Composer Gerald Fried provides a nice disaster flick score. There are no subtitles or closed captioning. The main menu is just a generic Warner Bros. water tank image where you can play the movie. No scene selections are available, but there are chapter stops. Unfortunately, there are no special features or even a trailer or promo spot included. The DVD-R disc has a picture of a tiger, Dale Robinette and Carol Lynley. The movie has a total running time of 96 minutes. Lions and tigers and bears, oh my! 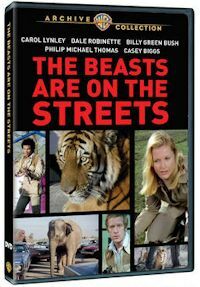 The Beasts are on the Streets has finally arrived on DVD as a manufactured-on-demand release from the Warner Archive Collection. I remember seeing this underrated TV movie gem on a local Atlanta station in the late 1980s/early 1990s. It's a movie that always stuck with me. It was never previously available on DVD or even VHS. The movie has likely largely disappeared from any stations in the last 20 or so years. Unfortunately, there was a real life and tragic situation in 2011 in Zanesville, Ohio, when a man released his exotic animals into the streets. I recalled this movie when hearing about that sad news. This is just a fun and entertaining movie. It's something you can watch on a lazy weekend afternoon and enjoy. Although it was a made for television film with a low budget, it's a very well made movie. It's kind of like an extended episode of CHiPs, which had one about a loose tiger in the streets. The Beasts are on the Streets features a solid cast, great action, suspense and terrifying scenes, a little humor and plenty of animals. There is excellent directing and cinematography. 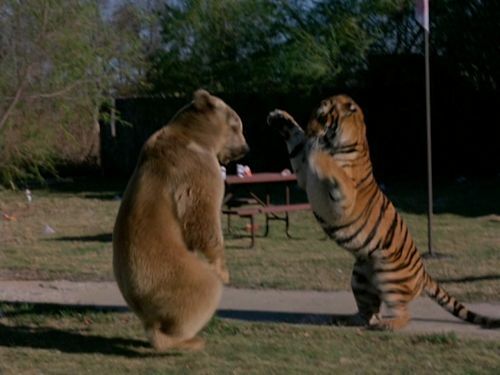 The highlight of the action scenes is an epic battle between a bear and tiger. There are also some good scenes of a car chase with ostriches and rhinos and another clash of a lion vs. a dog. Although the action is pretty intense, it's still family friendly because there is no gore. My only issue with the movie is how they sped up some of the scenes with the animals running or attacking. They could have used those scenes at the normal transfer rate or sped them up only slightly. Overall, it's a movie that I would recommend to anyone who enjoys the animals attack and disaster flicks of the 1970s. They just don't make movies like these days. If a movie like this was made today, it would be mostly CGI with few or no real animals used. Although the movie was supervised by the American Humane Society, the animal attacks and fight scenes seemed very real. No animals were hurt during the filming, however. The Beasts are on the Streets can be purchased via WBShop.com or Amazon.com . Some other animals attack movies to check out from the Warner Archive Collection include The Pack and Razorback. Who to Follow: Michael J. Fox (Twitter), "Michael Fox is a father, husband, actor, writer, activist, and purveyor of fine cheeses." Claim to Fame: The Canadian-born actor was mostly unknown when he was cast as Alex P. Keaton in the sitcom Family Ties, and if that fame wasn't enough, he became even bigger when he was cast as Marty McFly in the Back to the Future trilogy. Once the '80s were done, he had a bit more success in film as an adult, but he hit it big with another series on ABC in 1996, Spin City. It was during the third season of this series that he announced that he had Parkinson's disease and left the series... but now, he has come back to TV yet again with one of NBC's newest sitcoms, The Michael J. Fox Show, a series that is much like who he approaches life: dealing with the challenges that he faces with a positive outlook and a good sense of a humor.